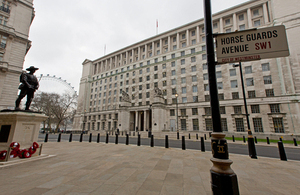 Money and information are two things that matter a lot to the military commanders in charge Operation HERRICK, and it's the job of MOD civil servants deployed to Helmand to provide that information and keep a close eye on the purse strings. Report by Ian Carr. As Civ Sec, my responsibilities cover anything of a financial, commercial or contractual nature. I produce advice and guidance to the command. I’ve only got $500 million to spend,” Stephen says wryly, “and that’s just the amount we spend on the contracting in theatre; it doesn’t account for food or staff costs, outside locally employed civilians. We use contracted rotary wing effort to move things around theatre. That’s about $20m a year but it’s a variable cost, as is fuel, we spend around $60m a year on that. Being plugged in, as far as possible, to the military’s plans helps Stephen to forecast these costs. A good example would be the Reception Staging and Onward Integration Training facility (RSOI, is the package of training that prepares all new arrivals in theatre for their role on arrival at Bastion). We were involved in the whole range of services to pull that together, from the contract to feed everybody involved in the training, to the infrastructure required to build it; everything from the projection equipment for the classroom through to building the replica Afghan compound, where the troops train, and even to the cost and provision of the goats and chickens to put in the compound. The Civ Sec was also responsible for the financial scrutiny, making sure that the business case held together, not just the financial element, but that the whole enterprise made sense and had been properly thought through. As Civ Sec, Stephen is also the risk owner for the 200 or so civilians in theatre, including personnel from DSTL (Defence Science and Technology Laboratory), such as scientific advisers and operational analysts, as well as civilians in finance and contracts. But what does being a risk owner mean? Everyone comes here with a risk assessment for their particular job, which describes the parameters of the sort of things they can do, and where they can go. Any thoughts of deviating away from that means I need to be informed so I can make a judgement about how necessary it is and what mitigations can be put in place to minimise the risk. For example, if someone wants to travel to a different location, such as a Forward Operating Base or a Patrol Base, we have to do a security check to make sure it’s safe and worth the risk. One of the surprising factors for me is that you really don’t know how people are going to react until they get here. As good as the training is, you don’t know what line management challenges you will face until people arrive and start to acclimatise. You presume they will be subject matter experts, and I’ve certainly been lucky in that respect with the people in my team, but it takes a while to adjust, not just to the environment but to the fact that you have to create, as best as you can, some kind of life for yourself; there’s no home waiting for you after work. Because it’s a military environment and they understand it in terms of whether my advice can be taken or ignored - how much weight there is behind the punch. As a B1, that puts Stephen somewhere between a Colonel and a Brigadier, so a fair bit of weight goes into his punch. Often I’m there to listen, so I know what’s going on around the military area and making sure they’re not getting themselves into difficulty either financially or contractually. And it helps if I know that a Warthog group is going out, which might lead to claims for damage coming in to one of my offices. If we know of an operation where damage may be done to compounds or crops, we try and talk to the land owners. It’s better to be consensual and come to an agreement for payment in advance rather than leaving the farmer to find the damage and come to us feeling angry. The other way we can do it is, if we know there’s going to be a land grab or a take over of a compound, then the engineering group can build the possibility of claims into their business group work. It’s made a big difference in understanding the totality of the project. It didn’t make sense to do the action then deal with the fall out. If we can prepare, then it helps. Of course if it’s a covert action we can’t do it. But,” he adds, “there’s been a marked reduction in irate claimants coming in asking ‘why the hell did you run through my field with a rather large Warthog’.